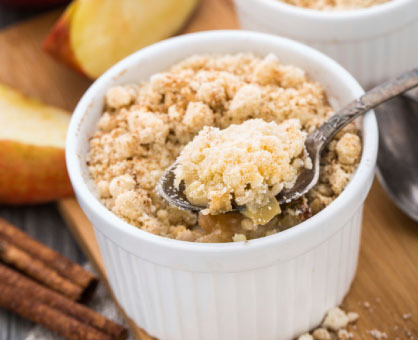 If asked to identify the difference between a crumble and a crisp, would you be able to? They have a lot in common. Both are made with fruit, butter, sugar and flour in one way or another. So how do they differ? The crumble hails from England. It’s made with a streusel topping baked over fresh, in-season fruit like apples, berries or peaches, and is often served with ice cream. Our recipe for Grilled Peaches with Shortbread Crumble uses shortbread cookies in the streusel for a delicious topping on grilled peaches. A crisp is the American version of a crumble. The streusel is typically made with flour, sugar, cinnamon and oats.